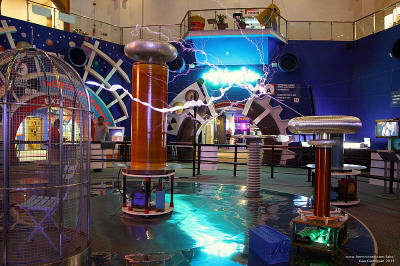 A Musical Tesla Coil in the Singapore Science Center! DRSSTC 3 represents the largest and most powerful of the solid state transistor tesla coils I've built over the past year (2013/14). In this project, I have tried to incorporate many of the things I have learned in my previous table-top DRSSTC 1 and medium DRSSTC 2 coils to produce possibly one of the most compact and powerful musical Tesla Coil in the South East Asian region. 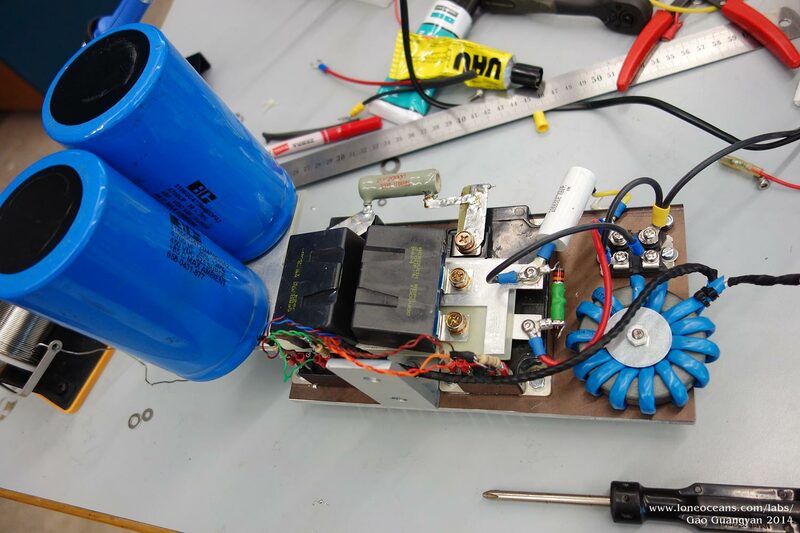 However, the goal of the project was not to build the most powerful coil I could, but rather to build a coil with prudent choice of components and using reasonable operating power supplies - i.e. the result being a coil running at the limits of what one can draw from a standard 15A 240V power outlet available in most homes, whilst still being easily transportable. After it was constructed in Jan 2014, it evolved into a prototype project in collaboration with the Singapore Science Centre, where some improvements were made. 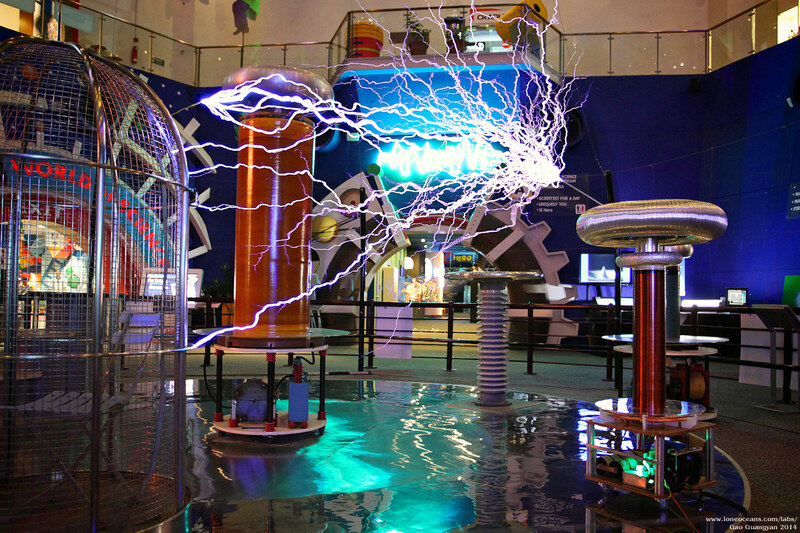 Today, it resides as a exhibition in the main atrium, accompanying the large spark-gap coil in the Tesla Coil cage, and is the first publicly viewable musical coil in Singapore! 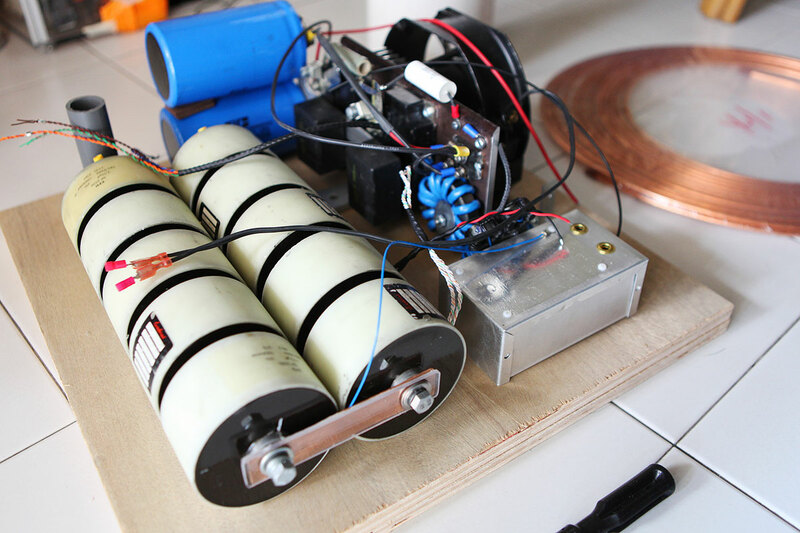 I hope this page will be a resource for hobbyists around the world looking to build their own Tesla Coil. I have described in detail the specifications of my coil for the good of the community and you are free to use this design, and any reference will be appreciated! Thank you for visiting my page and if you have any questions, wish to share your projects, or feel that my projects have inspired you in one way or another, feel free to contact me at loneoceans[at]gmail(dot)com. Despite this being the most powerful tesla coil I have built, it also turned out to be one of the most straightforward constructions due to prior experience with my previous coils. However, its power and size required care and attention to more details during construction. This page documents the general design, construction and results of this project, as well as the general workings of DRSSTCs. For a more detailed description of the nuances and operating principles, please refer to my previous project pages. The motivation to build this coil was the desire to create a compact master showpiece about 1.2m tall and generating sparks in excess of 2m length. 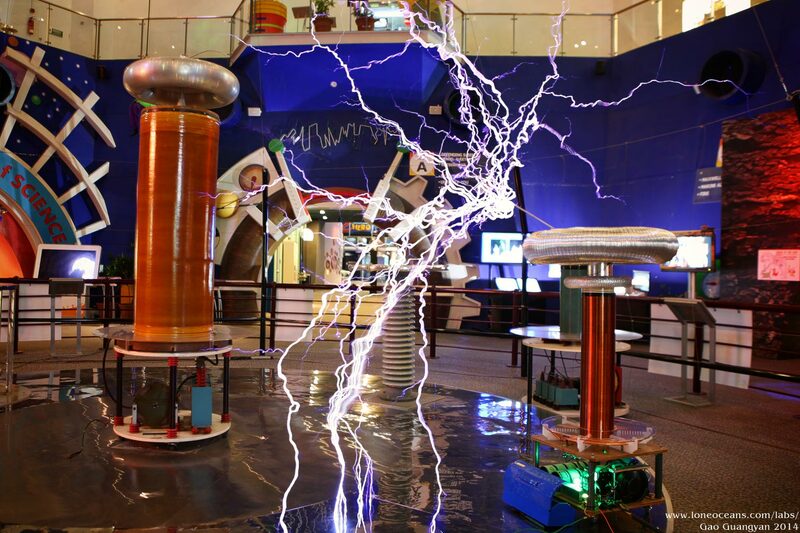 As of writing, the largest Tesla Coil in Singapore seems to be the Tesla Technology Research Tesla Coil (a Model 9 variant) in the Singapore Science Centre. 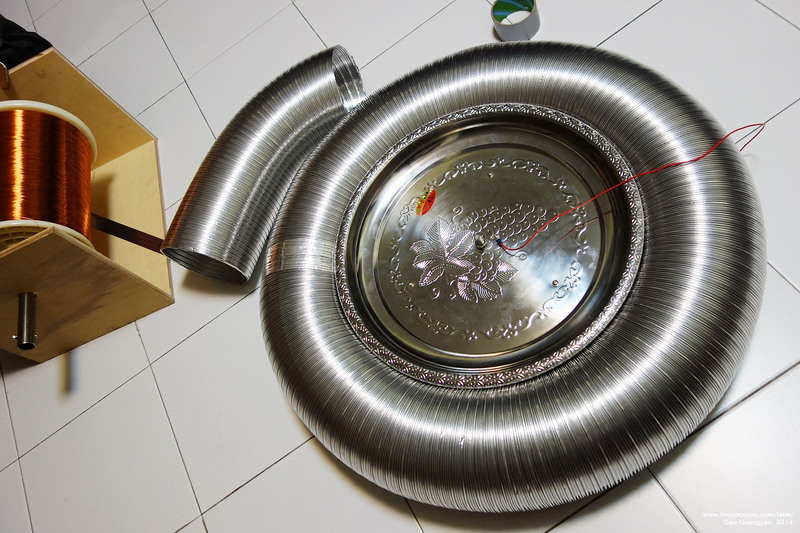 Despite limited funding and resources, the goal of the project was to produce a museum-worthy coil to rival the one in the Singapore Science Centre, producing greater of equal spark output, whilst remaining significantly smaller in size and half the input power albeit still using a prudent choice of materials with a limited budget. 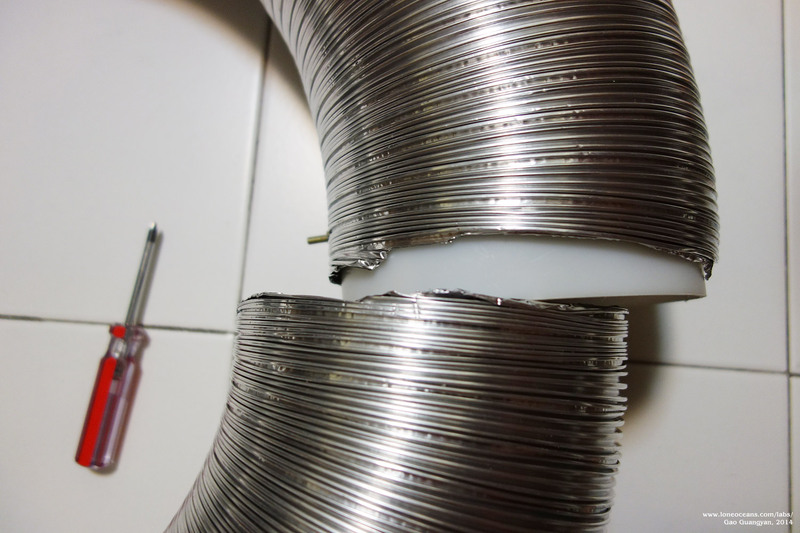 [Update Feb 2014] This project progressed well through the month of January, where practically the entire coil was built over the course of the first 3 weeks of the month. However, a turn of events led to interest in the project from the Singapore Science Centre, and the project evolved into a collaborative one. 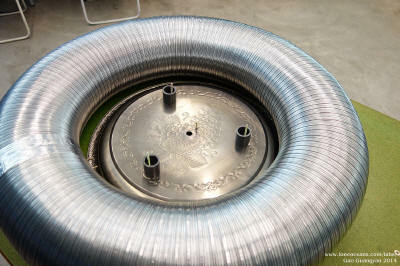 In February, the completed coil was moved to the Singapore Science Centre, where some modifications were made in terms of reliability and better components. Thus DRSSTC 3 joins the main spark gap Tesla Coil in the main exhibition atrium, as a prototype of the very latest transistor tesla coils capable of playing music. 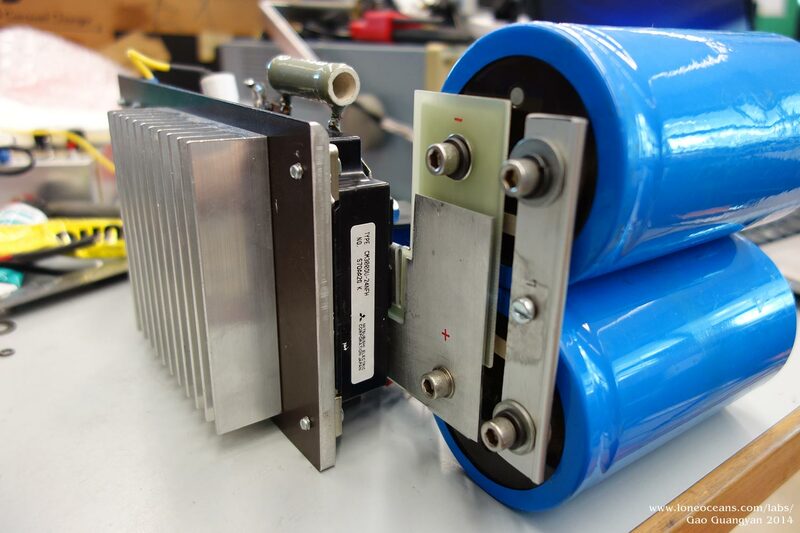 SSTC are essentially a power inverter driving a coil at its resonant frequency, typically via 100-1kV square waves. The most common topology for implementing this is a conventional H-bridge of half-bridge. Usually MOSFETs or IGBTs are use due to their high switching speed and current handling capability. Some sort of feedback is usually used to allow the coil to be self-tuning and thus resonant automatically. After the conventional SSTC was developed, hobbyists around the world were in search of even greater spark output, leading to the Double Resonant SSTC. The game plan is to not only make the secondary a tuned circuit, but to also have a primary circuit tuned at the same resonant frequency. When the primary coil is now driven by the inverter at resonance, there is a far greater impedance match to the secondary circuit. Due to resonant voltage rise, a much higher voltage develops on the primary coil (to several kV). 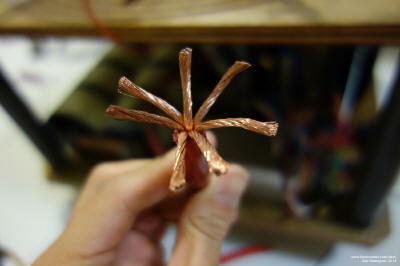 Since there is a greater voltage, a much higher primary current can flow (several hundred amps), creating much larger sparks on the secondary side. 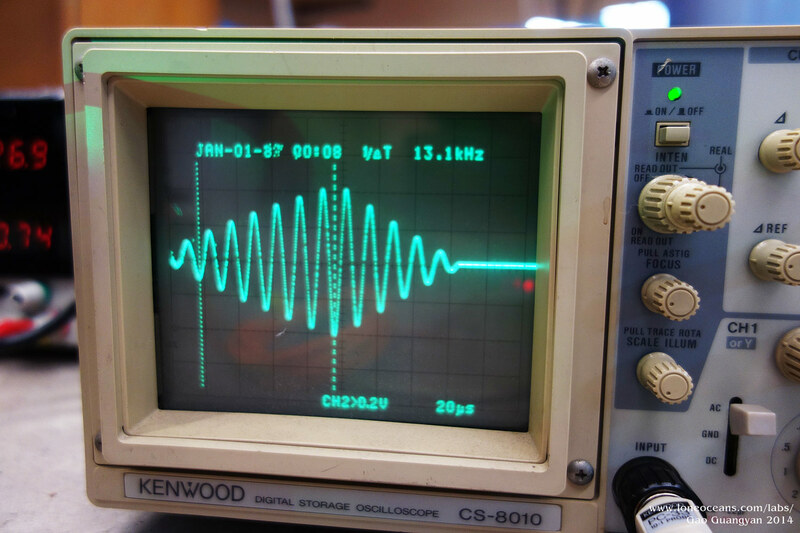 To prevent the transistors from failing at such high peak currents, the coil is driven in an interrupted fashion (several RF cycles, usually resulting in several hundred us) at a time, each pulse being several ms apart. The average duty cycle is therefore low, on the order of a few %. This controller which interrupts the coil is known as an Interrupter. 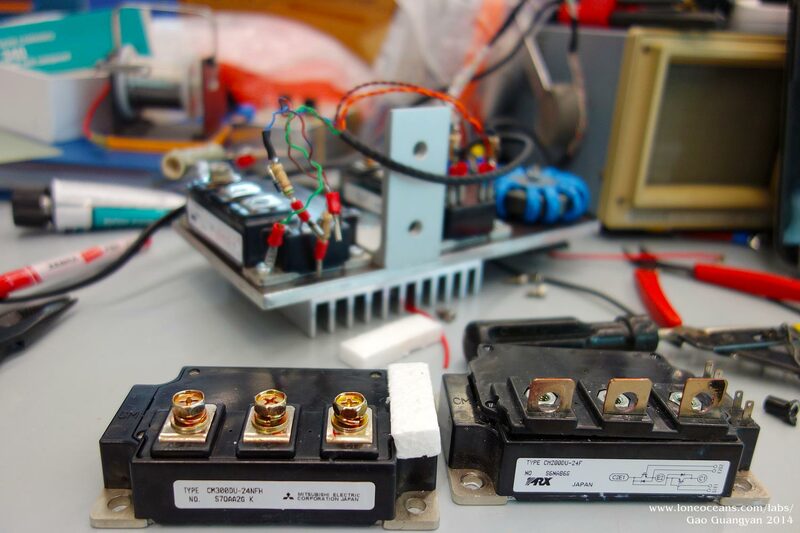 In the case of DRSSTCs, IGBTs are often used instead of MOSFETs due to their better high current handling capability. Recent advances in technology have also brought the switching speed of these transistors up, and their costs down. Therefore, IGBTs are now the transistor of choice in the modern day DRSSTC. In order for the operator to control the coil safely, the interrupter is usually controlled via fiber optic from a control box. The Pulse Width and repetition frequency can be controlled. In order to produce music, the repetition frequency can be modulated based on the desired tone. This is easily achieved via a microcontroller interpreting MIDI signals, and converting them to rep frequency. E.g. an �A� note will correspond to a 440Hz rep. frequency. 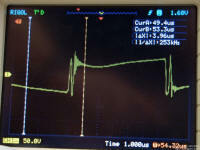 The pulse width can then be used to modulate the volume of the spark. The output sounds harsh, but is unique in its own way. Building a large DRSSTC invariably involves the use of large IGBTs. Although the price of IGBTs have dropped significantly in the past few years in part due to their popularity in electric vehicles, they are still very expensive and form the bulk of the cost of the coil. 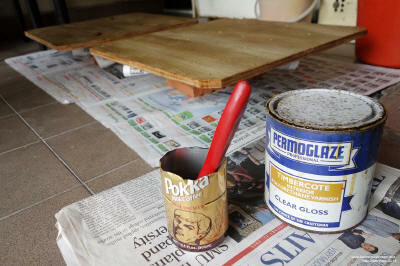 With limited resources, I had to work with what I had. Fortunately, I managed to get some CM200 IGBTs. These are of the standard brick-style and in the same line as the CM300s and CM600s that have been known to work great in large DRSSTCs. As such, the power capability of these IGBTs forms the upper limit of the coil's power design. Eventually, the CM200s were replaced with CM300s for greater reliability. Below outlines the process by which the coil was designed. The input power of the coil depends on several factors, notably the frequency, running pulse widths, repetition frequency as well as primary impedance. I knew from the beginning that I wanted the coil to draw the maximum power I can from frequently found sources. 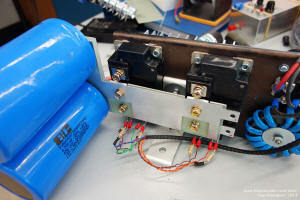 This places a single 15A 240VAC output as an upper limit of 3600VA for the coil. The 15A line is part a 30A ring system found in most homes, hence the coil should also be able to run at the ballpark of 7200W peak via a (relatively common 32A breaker. I also wanted the coil system to be easily transportable in the boot of the car, and yet produce impressive sparks exceeding 2m in length. With this in mind, I decided to build a medium sized coil around 1.2m in total height with a primary capacitor of 375nF running on voltage doubled 240V mains for 678VDC on the bus. 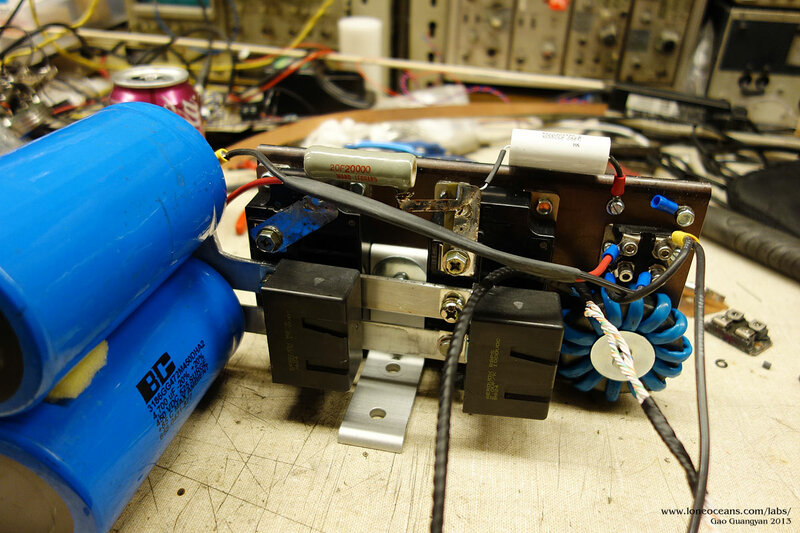 The heart of this Tesla Coil is the inverter which runs off a doubled 240VAC bus for +-678V across the primary. However, I needed to choose the right transistor for the coil. Some of the largest DRSSTCs built by coilers like Steve Ward and Philip Slawinski uses the CM600 series brick IGBTs, good for 600A, 1200Apk and produce 5m sparks with around 5 to 12kVA input. However, there are drawbacks to using CM600 including expensive cost, need for a very powerful and robust gate driver, as well as low switching frequency in the ballpark of 30kHz. With the planned running power of around 3kVA, it became clear the use of such IGBTs would be perhaps overkill and not necessary. Therefore the next best candidates were the famed CM300 IGBTs, especially the latest NFH line rated at 300A at 60-70kHz or so. Regardless, these IGBTs modules were going for around $100 used a piece, making them still quite expensive. In the end, I decided to use CM200DU-24F IGBTs in a full bridge configuration, transistors I already had on hand. Steve Ward has tested the CM300DY-24Hs extensively, testing up to 5kApk at ZVS (zero voltage switching) before catastrophic failure. Furthermore, these IGBTs are known to run consistently well at 1500Apk if switched correctly. With a 33% derating, it doesn't seem too far fetched to push the CM200s at 1000Apk. Eventually, to improve reliability, these CM200 IGBTs were replaced with CM300DU-24NFH IGBTs with the current limited set at 700Apk. They both have the same footprint and package, making swaps with the previous CM200s a simple task. 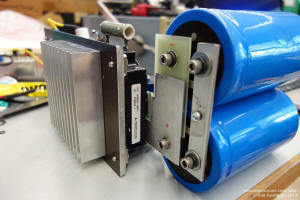 For reliable gate drive, I opted to use a simple and proven Gate Drive Transformer (GDT) made using a large ferrite core. In addition, feedback will be taken via two 1023:1 current transformers, providing variable phase lead for tunable ZVS and OCD setting. 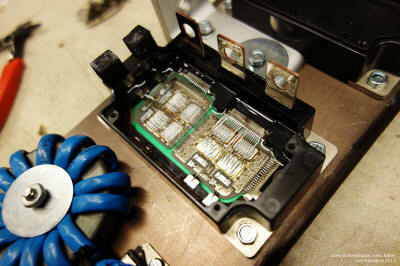 To reduce voltage spikes when switching, the bus caps will be installed as closely as possible to the transistors via a laminated bus. The bridge is then snubbed with 2uF 1kV snubber capacitors bolted right on the IGBTs. The reasonably low-inductance design and the 1200V rating should hopefully keep the bridge running well and reliably. Cooling is also essential. The IGBTs will be mounted on a large heat plate. 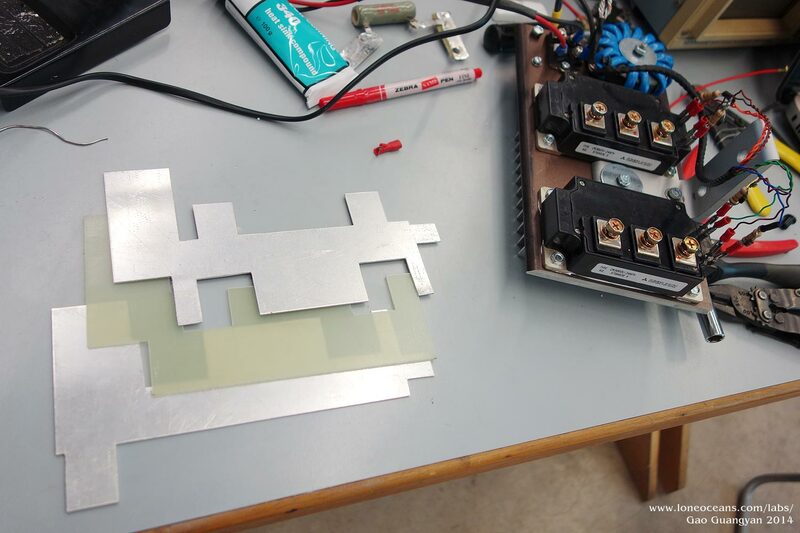 In order to move heat away as quickly as possible from the system, I have opted for a thin plate design with a strong fan actively blowing against the heat sink fins to dissipate heat as quickly as possible. 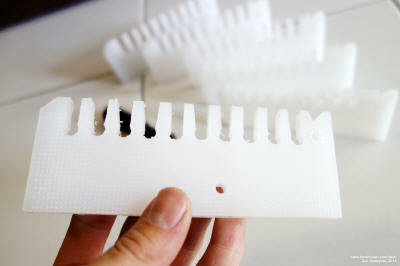 This is opposed to using a large heat sink which will be good for short runs, but may end up as a large thermal burden during longer runs. Because of the high RMS currents the resonant capacitor will face, it is imperative to design one capable of handling this enormous power. The standard practice is to use the famed CDE 942 metal-film PP capacitors of the 1.5uF 2kV variety. However, building a suitably sized bank will end up costing hundreds of dollars. Instead (and I have to thank Bayley for the suggestion), I managed to use some very nice pulse film caps on eBay, each rated 580Vrms, 150Arms at 3.75uF. Ten of them in series provides a large but cheap and powerful MMC capable of 150Arms at 375nF, and should have no problems at all handling that power. As far as I know, these caps have been tested by fellow coilers up to several kV each before soft failures (like a typical PP film cap), so a 1kVDC rating each should be in the ballpark per cap. 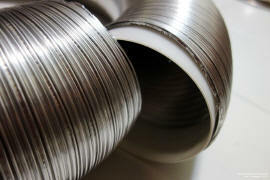 In addition, they have been used in other large coils and have shown excellent performance. This gives me a fantastic 10kV 375nF bank to work with. 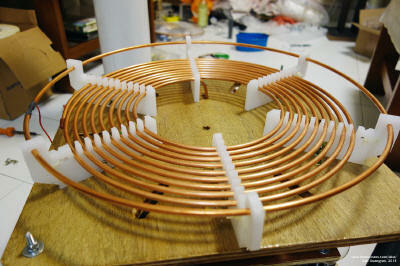 With the preliminary design done, it was time to begin building the coil! Construction took place beginning at the end of December through the 3rd week of January 2014. Some components were later upgraded in mid Feb 2014. Building the inverter was straightforward and took one afternoon of work. 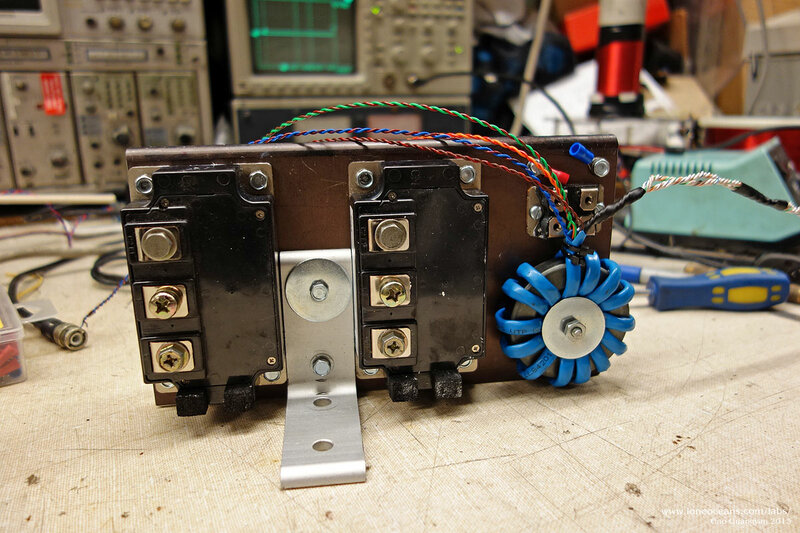 An aluminum heat sink was drilled and tapped to accept two of the CM200 IGBTs, with space for a rectifier brick and the gate drive transformer. The GDT was wound using the classic method of using a single CAT5 Ethernet cable (4 twisted pairs) for a total of ~14 turns on a large ferrite core, each going to the IGBT with a 1N5819 and 5.1R gate resistor per IGBT. 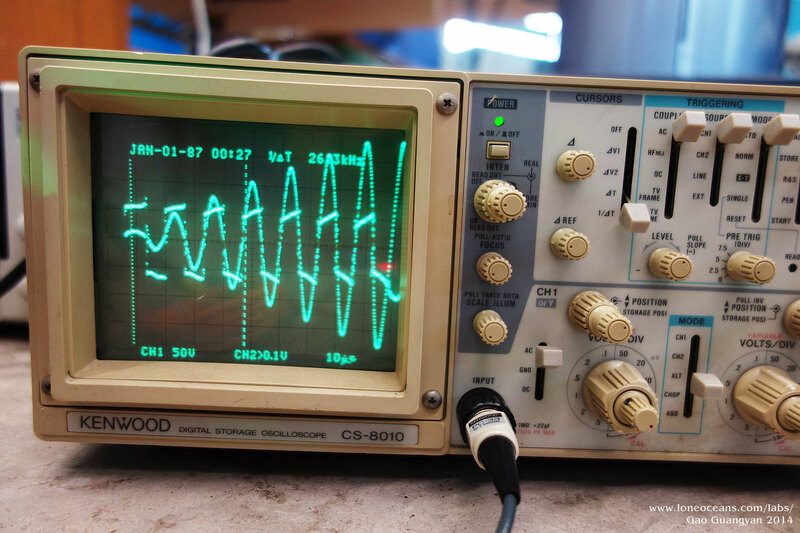 It is important to select a suitable ferrite core, and this was tested by wrapping several turns of test wire on it, and checking its output with a square input from a signal generator at around 60 to 70 kHz. 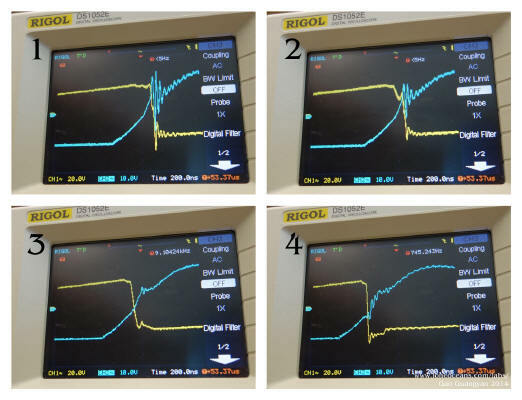 The output should be as square looking as possible (as can be seen on the right photo with the input being a square wave). The current transformers were also made, giving a 1023:1 step down ratio. Cores used were the Fair-Rite 5977006401 Type 77 and 5000-1 Fair-Rite cores. Note that I stacked them to reduce the number of cores. The bridge was then connected to two bus caps each rated 450V 4700uF, forming a doubled circuit with the rectifiers. This puts the bus capacitance to only 2350uF at 680V (input max), making it a little small but should work fine (my DRSSTC 2 has worked really well with a doubler with less than half of this capacity). Snubber capacitors designed specifically to absorb transient spikes were also added (4 uF in total). Two additional features were also added. From the work of Steve Ward, a 7k 20W resistor was placed across the bridge output. This serves to bleed any residual charge inside the MMC after each pulse, which helps start-up oscillations. The reason for putting it across the bridge instead of the MMC is that we do not need to deal with the high voltage that builds up across the MMC. Finally, a small 68nF 3kV film cap was wired to the grounded heat sink and to the negative rail (note that this is wired incorrectly in the photo above). This was also invented by Steve Ward, as a means of protection in case the primary were to be struck by an arc. This capacitor then provides a path for the arc to ground and hopefully save the electronics. Additionally, grounds strikes can cause the 'ground' to bounce up many kV relative to other supplies (since most grounds are not 0 impedance). This 'RF-bypass' capacitor helps prevents any large voltage transient that may stress our silicon switches and their insulation. EMI suppression is important! The IGBTs I were using come with RTCs which acts as a over-current limiter, set at 400A. Disabling it is straightforward but must be done carefully. The cover was removed (takes a little bit of fudging and alignment with the main power leads), then a total of 8 wires were cut, 4 per IGBT. These wires are crossed in red in the diagram above. Be careful NOT to cut the gate wires. Finally, an L bracket was added for easy attachment. The resulting inverter is very well contained, with 2 power inputs, 2 gate transformer inputs and 2 bridge outputs. All wires were connected with stranded 4AWG cable, with two 1023:1 current transformers feeding the feedback and OCD to the driver circuit as described previously. 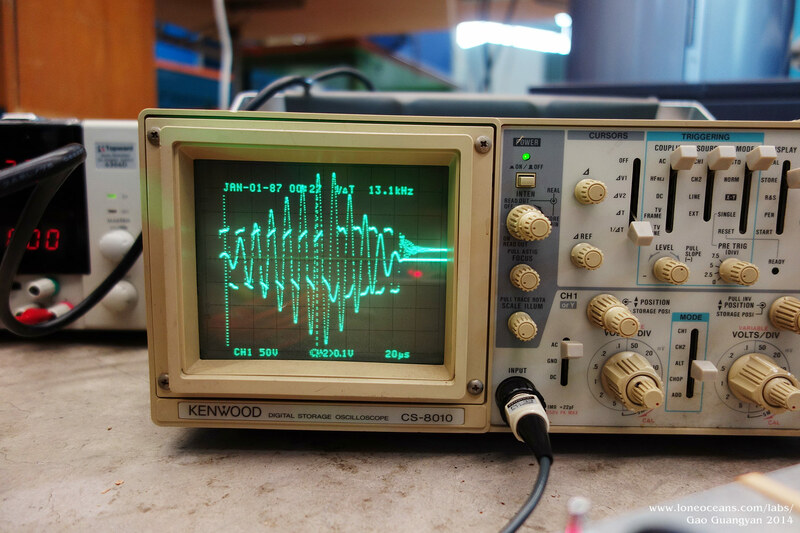 For more reliability in mind and with some extra funding, I decided to replace the IGBTs with the nice CM300DU-24NFH IGBTs, good for 60-70kHz soft switching according to the datasheet! In addition, to make the setup as robust as possible, I decided to replace the bus with a low-inductance laminated design. The high coupling between the rails creates a very low inductance bus which should help reducing switching transients as much as possible! The laminated bus layout is not as ideal as I would have wanted it to be, but was designed to fit the existing physical constraints of the coil. I designed the three layers and cut them out of FR-4 fiberglass and aluminum sheets (1/16"). Tabs were included and allow for easy connection. The bus was glued together and then bolted onto the bridge. The result turned out to be much nicer than I thought it would be and I am very pleased with how it came out :). 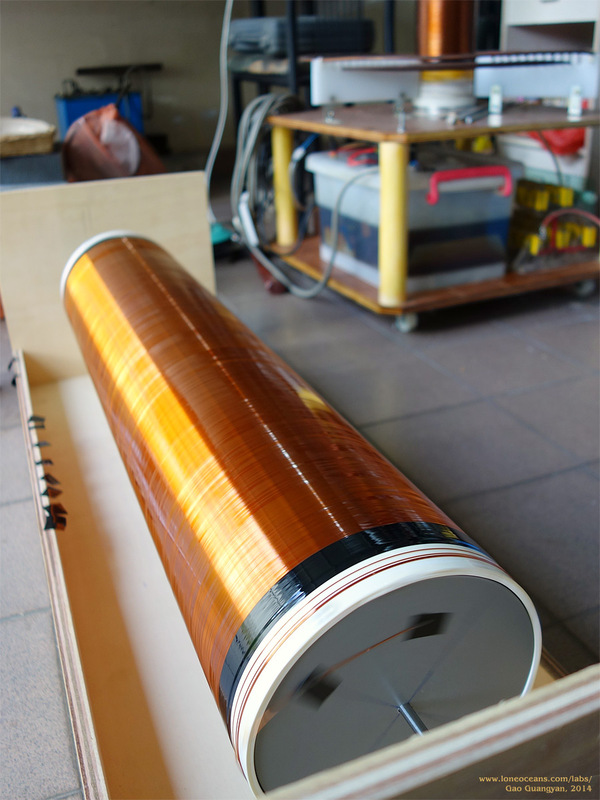 The laminated fiberglass and aluminum have no problem supporting the big electrolytic capacitors. Note that the completed bridge block also includes the GDT, balancing resistor, bleeder resistors, RF bypass cap as well as doubler diodes and snubber capacitors. I was originally planning to use the famed CDE940/942 series polypropylene film capacitors, but making a suitably sized one (I wanted somewhere between 300 and 400nF at about 10kV) was turning out to cost several hundred dollars. Eventually with a great suggestion from Bayley, I was able to obtain these nice set of capacitors from Ebay. 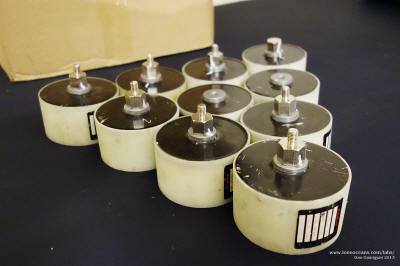 These are the Eurofarad SP2550 3.75uF 580Vrms 152Arms film capacitors. These were wired 10 in series for a 375nF bank good for 152Arms. Check out the 4hv thread on these capacitors here. To put everything together, I first laid out all the components on the floor and managed to fit all of them within a 18.5" square. I then machined two 15mm plywood pieces ($10 in total), one forming the base and the other forming the top where the primary and secondary coil will sit. 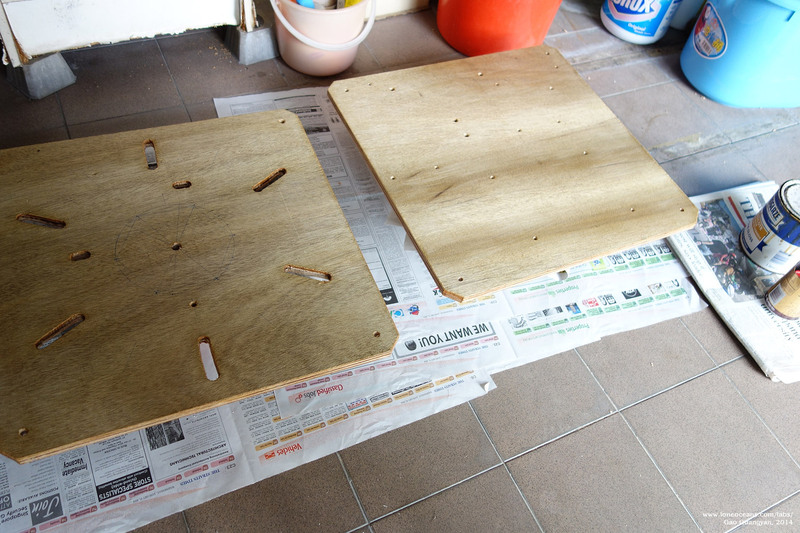 Appropriate holes were cut and drilled into the two wooden pieces. The layout of the components were adjusted, then each of the boards was then coated with three layers of varnish for protection. 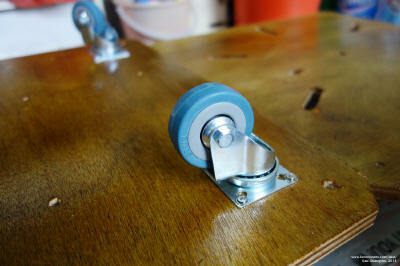 Four nice rubber wheels ($12) were then screwed onto the base for easy transport. 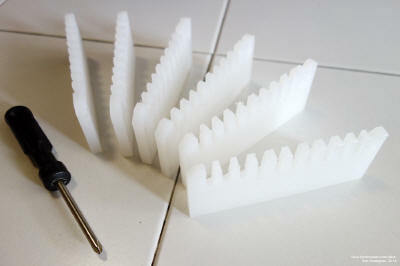 The two platforms are separated by 1" x 9" PVC supports ($1) and held together via M6 threaded rods. The total volume of the box turns out to be only 63% of that of my Tesla Coil 2 mark ii (albeit with a larger secondary)! Hopefully, it will produce even bigger sparks! I decided to use the tried and tested snap-in polyethylene supports for the primary coil just as I had made it for Tesla Coil 2 mk ii, using 6 supports instead of 3. 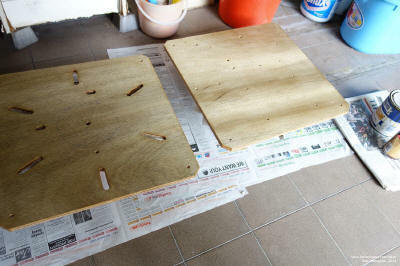 I used a large 10mm spare chopping board as the base material. 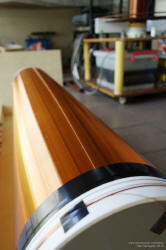 The choice of PE was straightforward due to its ease of machining, low cost (plastic chopping board! 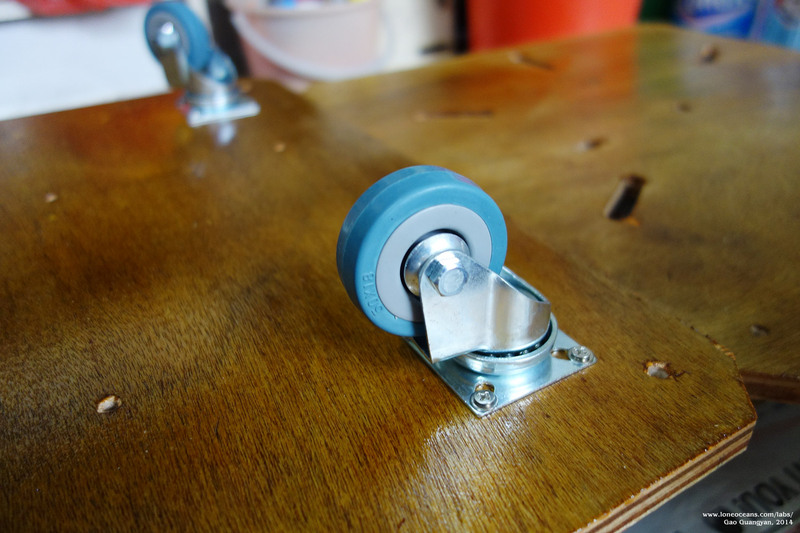 ), and its softness made it easy to press-fit the primary coil into the supports, although admittedly, a more heat-resistant material would be a better choice. Without any access to a proper machine shop or a laser cutter, I cut the materials by hand using a jigsaw and a drill press. The size and spacing of the primary coil (1/4" copper tubing, costing SG$45 for a 25 ft reel - copper prices are going up!) 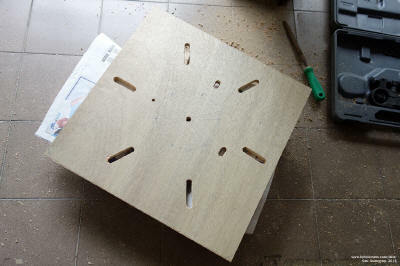 was decided to be 12mm, which allowed a total of 9 turns to fit within the the 18.5" square base. 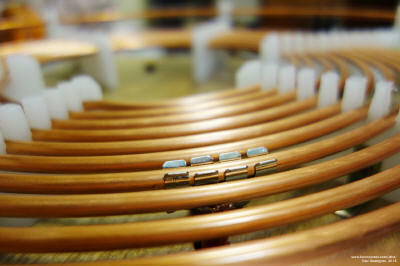 These were then affixed down to the wooden base via small L brackets. Once done, the 1/4" tubing was press-fitted into place, and the leftover tubing was used to make a ground strike ring. 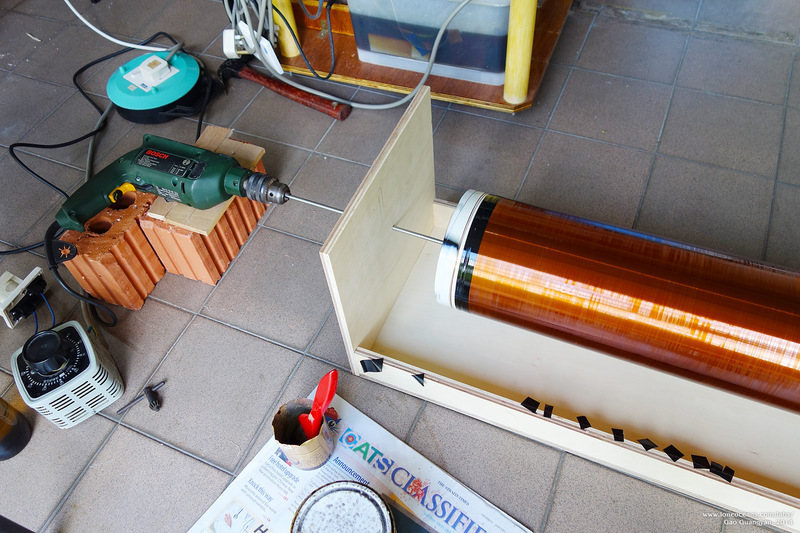 The result is a simple, sturdy primary coil. Finally, the primary tap was made from 4 fuse holders soldered to stranded 4AWG primary cable allowing for a secure and adjustable connection. Having made many secondary coils now, the construction of this one was relatively straightforward. To begin, I used a 6.3" PVC pipe 30" in length and machined two end discs out of 12mm PVC. This was attached via three screws through the sides of the PVC pipe into holes tapped into the thickness of the grey PVC discs. This allowed me to put the pipe onto a makeshift wooden stand which I could then wind the wire on. The coil was wound for a total length of 27.5" with 0.35mm (SWG 29) double coated enameled copper wire for a total of just about 1850 turns. The wire reel I was using weighed just about 25kg, so a sturdy wooden stand was constructed to hold it into place, allowing it to rotate smoothly on a 1" stainless steel pipe. After the coil was wound, the ends were secured with black vinyl tape. To seal the windings, the coil was then carefully covered with four thin layers of Polyurethane varnish, sealing and protecting the coils. To prevent dripping, a drill connected to a variac was connected to the coil (about 60rpm) whilst the coil was being varnished. A big coil requires a big toroid! DRSSTCs especially like big toroids! 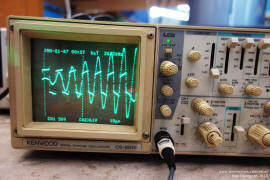 I originally planned to use a AWG 30 or AWG 29 (or SWG 30) wire to wind the secondary which would have allowed me to achieve a sub 80kHz frequency with my existing 5.5 x 20" toroid. However, the only wire I was able to get was SWG 29, which required a larger toroid for a suitable resonant frequency. Thus I decided to simply use 6" aluminium ducting which was formed into a large ring 30" in diameter. A thin plastic collar 2" wide was used to secure the two ends together. 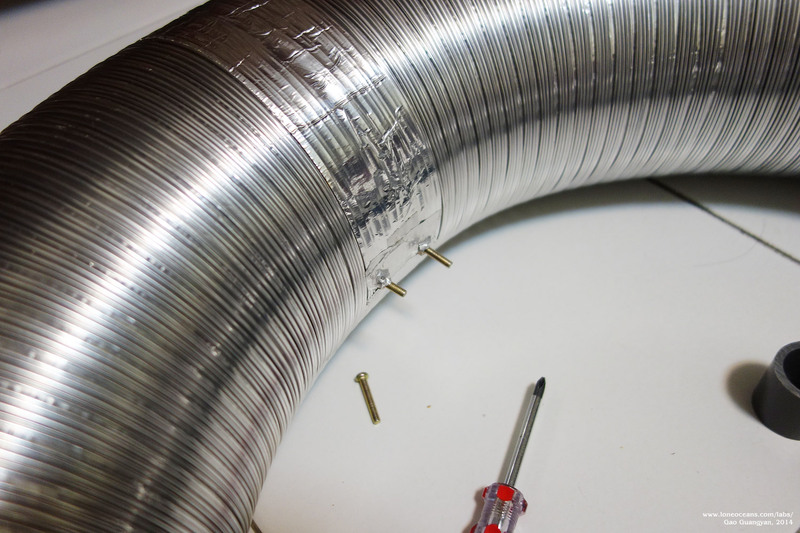 In the inner side of the toroid, two bolts were used to secure the plastic band to the ends of the toroid (using some clever positioning), and the connection was secured using aluminium tape. Finally, two 45cm stainless steel serving plates were used to hold the toroid in place and held together with bolts (they were cheap :) ). 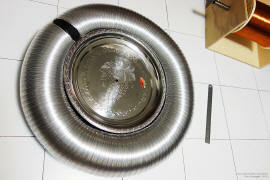 Above is another picture of how the toroid was constructed inside. PVC spacers were used to hold the plates apart. The torus sits nicely held together by its own compressive tension. 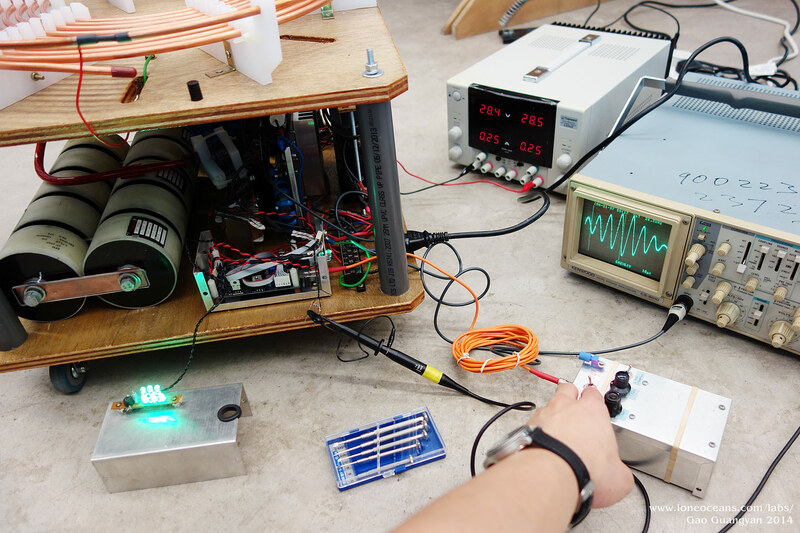 At this point with the coil basically complete with only tuning and testing to go, the project caught the attention of the Singapore Science Centre! Leaving the coil in my house would be nice, but I decided that it would serve a far greater purpose with the Science Centre instead of collecting dust in the corner of my room. So we worked out a collaborative plan to bring a new prototype exhibit to the Science Centre via this coil! 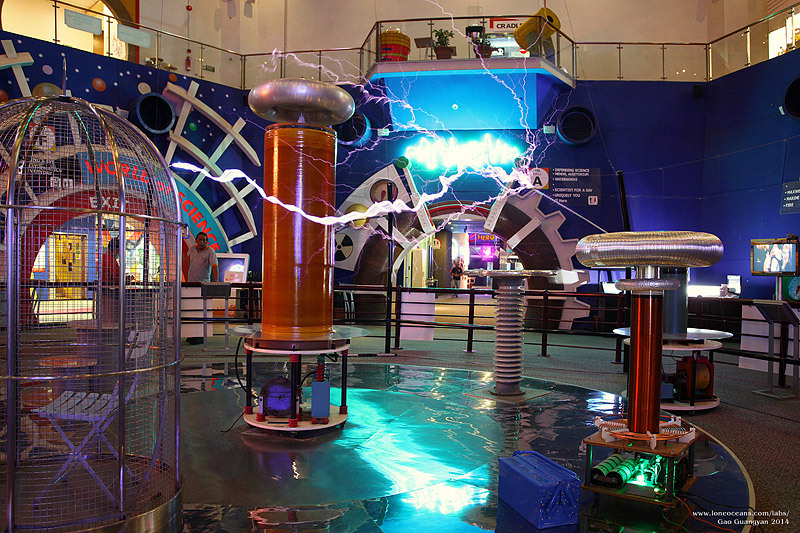 The Singapore Science Centre (SSC) has had a conventional rotary spark gap coil on exhibit (and with daily shows) for the past several years. 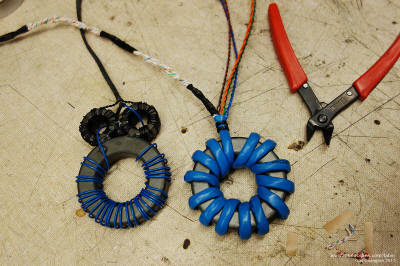 While it has been a very successful exhibit, it is perhaps time to usher in the new breed of musical electronic coils. 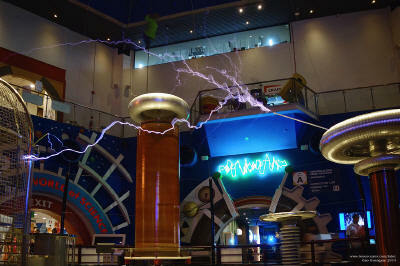 With this project, I hope I can bring some of this new technology to the show and to revitalize the tesla coil exhibit! The completed coil all assembled up in the prototype workshop. With this collaboration, I was able to obtain some workshop space to conduct some testing and tuning for the tesla coil. In February 2014, the coil was moved to the prototype workshop of the SSC for final touch-ups and tuning. With all the main physical parts of the coil complete, it was time to do some preliminary measurements on the resonant frequency of the circuits. The current specifications are as follows with the secondary coil 6.3" x 27.5" with ~1850 turns of 0.35mm wire. The primary coil varies with turn 5.92 at radius 7.1" and turn 5 at radius 6.62". 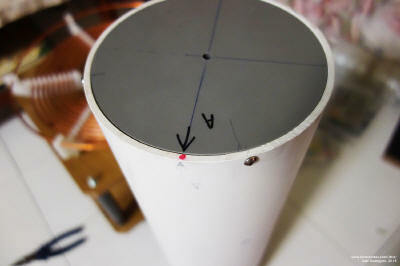 The main toroid measures 28.5" x 6" with a secondary one being 12.6" x 2" for corona control, spaced about 7 inches apart. Simulations were done using JavaTC 13. Turn 5.92 gave a measured resonant frequency (with no secondary in place) of 64kHz, close to the simulated 67kHz. Turn 5 gave a measured resonant frequency of 78.9kHz (with secondary and toroids in place) with a simulated 77.95kHz. 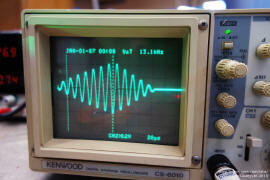 Turn 5.41 gave a measured resonant frequency of 71.8kHz (simulated 71.88kHz) (25.6uH, 417nF). 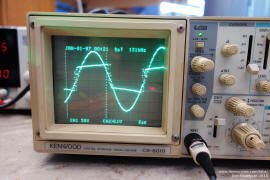 An extra turn of ~6.41 should give 61.46kHz (simulated). The standing secondary coil with no toroid gave 143.3kHz which suggests 1850 turns of wire - considering optimal packing would be 1887 turns (with wire thickness with enamel of 0.37mm), this seems to be a good figure of 98% packing. With both toroid and secondary in the middle of the primary coil, a secondary resonant frequency of 79.9kHz was measured, close to the 78.4kHz predicted. With simulated streamer loading of 2m wire from the top of the toroid, the new resonant frequency of 70.5kHz was measured. 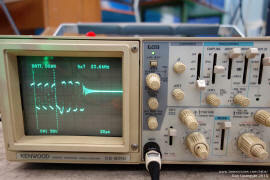 With a coupling of 0.148k, this places the lower pole of the circuit to be 74.5kHz. This suggests that turn 5.41 on the primary coil should yield good results which is what the primary coil is currently set at, with a 11% detuning. Hopefully, this will give big sparks for the goal of 2m! From this, one cycle will take 14ns. My interrupter is set to 135ns max at the moment, which should give 9-10 cycles of run time. 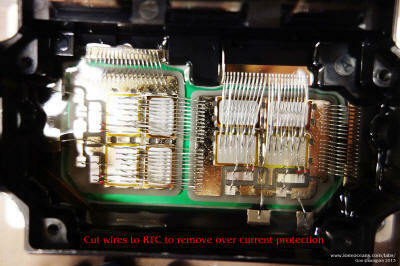 The coil was later found to run very well with just 5 RF cycles. With the resonant frequencies checked, I proceeded to test the logic and bus with an isolated power supply. 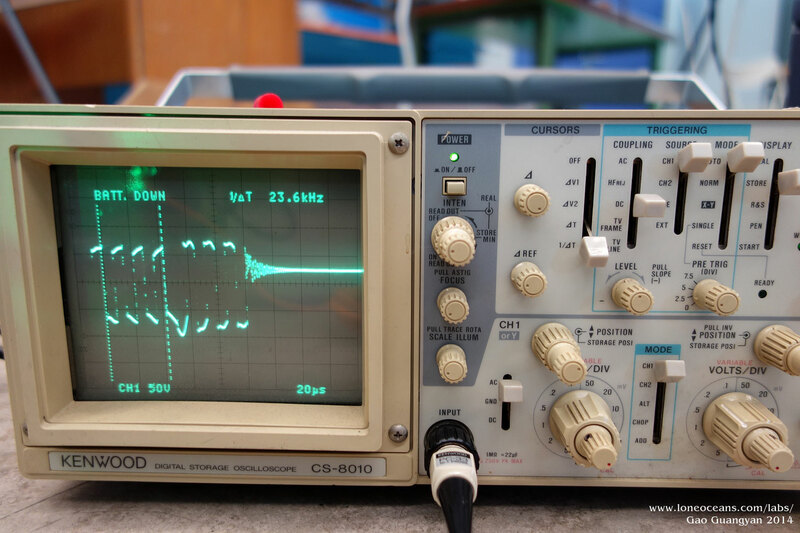 The driver was tested by applying a small 70kHz sine wave into the feedback input, and measuring the drive output. A few debugs later and a replacement of a dead resistor and all checked out as expected. This was then connected to the inverter and the bus charged up to 50V. 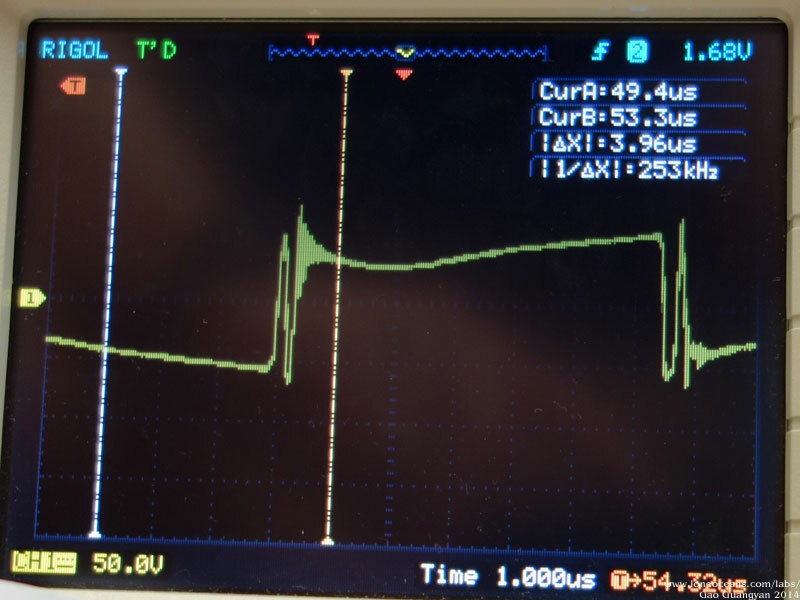 It is important to test the inverter with an isolated supply, which helps in measuring bridge output (especially since I'm using a voltage doubler. Current limiting on the power supply also helps. In this case, the bridge was found to be working as expected (very important not to mix up the phase of the gates which will lead to shoot through) and started up reliably by itself with 50V on the bridge. 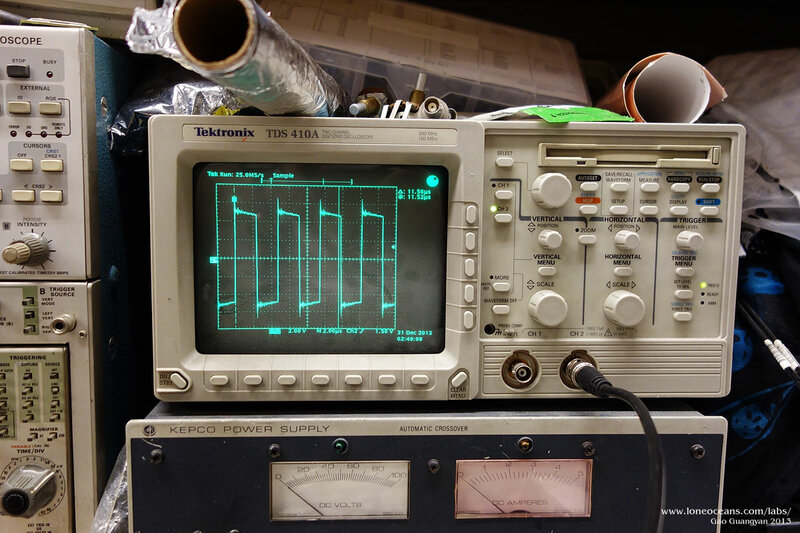 Finally, phase lead was carefully adjusted to make ringing to a minimum (checks out ok but would prefer an analog scope to find nanosecond transients) and is now ready for power testing! First testing was carried out on 6th Feb with an isolated power supply at 60VDC into the bus limited at 3A. The pulse width was set for a maximum of 50us+ (3 to 4 RF cycles). The coil responded well, producing a clean buzzing sound you'd expect from a tesla coil, and produced it's first 2-3" spark to ground at low power! This started interfering with some other electronic equipment including the power supply (all was fine) as well as the telephones in the workshop(! ), so next up will be power testing from a large variac in a suitable space. We can also determine the upper bound of the MMC voltage. Suppose the bus is charged to V. On a full bridge, we switch between -V and +V. On the first half cycle, the MMC is charged to V. On the second half cycle, it becomes -2V, then 3V and so on. So a rough idea of the MMC voltage can be given by V_mmc = V * N, where N is the number of half cycles. 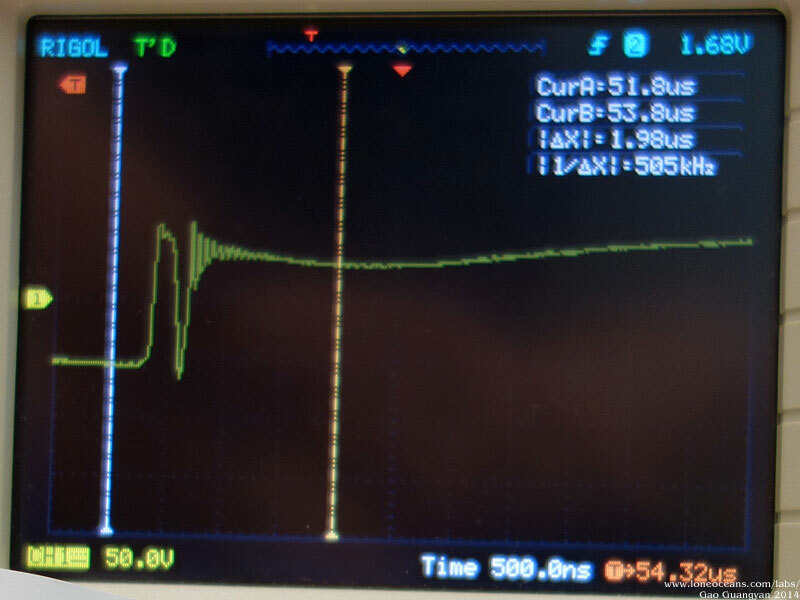 For a previous test running off a power supply, I measured 59A peak in about 3.5RF cycles at 57V on the bus. The calculated current comes up to be 62A which seem to be in the ballpark (78.9kHz). At 71.8kHz (current configuration after power testing), at 200VAC in, I will hit 793A just after 56us (4 cycles). At 150VAC in, I will hit 743A at 70us (5 cycles). At 135us, this gives me 764A with 80VAC input! In the maximum case of 135us and 240VAC, a max current of 2294A is achieved, or 1912A at 200VAC, 1433A at 150VAC. Note that this is an approximation of the highest possible current with no losses in the circuit. In practice, energy is transferred to the secondary dropping it significantly. In addition, spark loading drops the quality factor Q of the circuit - resulting in a higher rate of energy loss. 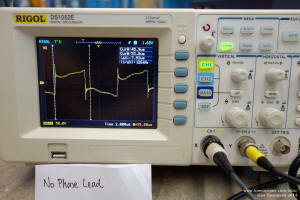 Phase Lead - Additional Tuning with a real scope! 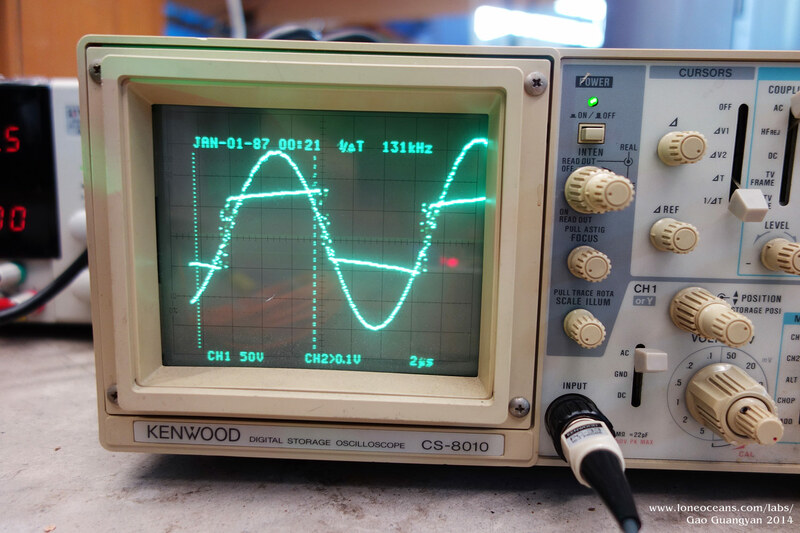 I was originally using a 40Ms/s scope to check the output of my bridge, but this was not very useful - the low sampling rate meant that I could not see if there were any voltage spikes or not on the bridge! So I borrowed a 1Gs/s Rigol scope! This was very useful. 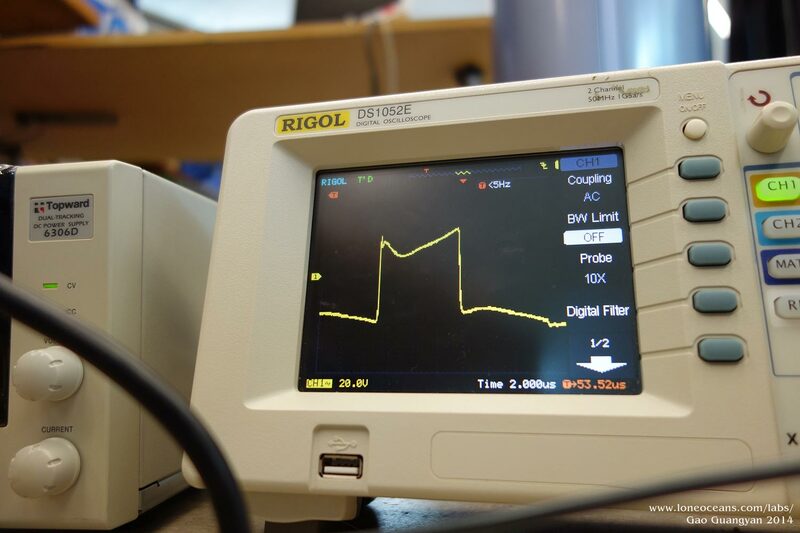 I've including some scope shots and hope this will be helpful to anyone out there debugging their DRSSTC! For those who are not sure what phase lead is, phase lead is a method of switching the transistors in the inverter slightly earlier than zero current crossing. This is beneficial due to the short delay the transistors take in becoming fully conductive. 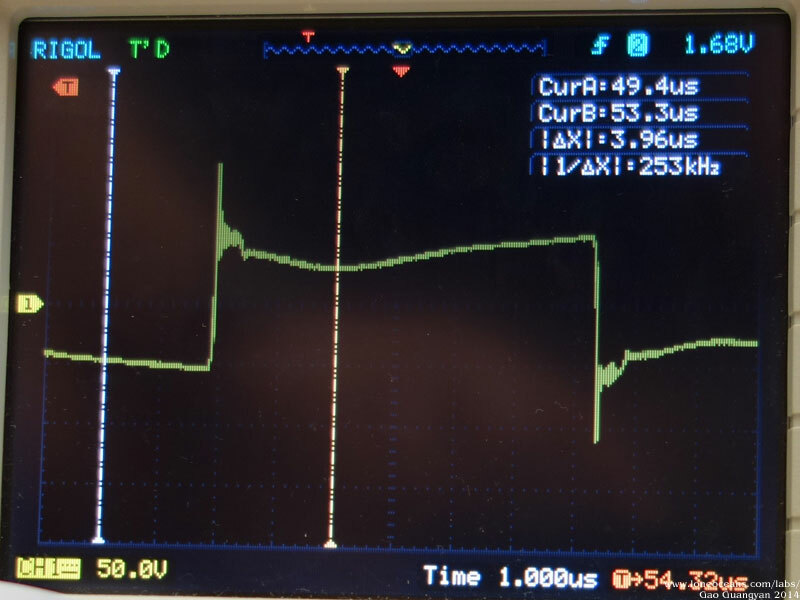 Switching early allows us to switch precisely when the current is at zero by using a reference current that leads the actual primary current! 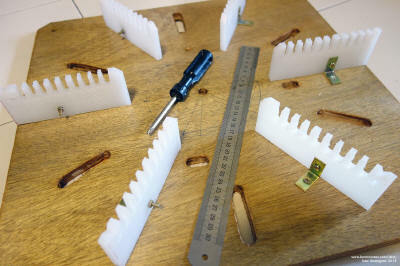 An adjustable inductor is used to adjust how early the switching begins. This has strategy has been implemented in several control schemes, notably Finn Hammer's Prediktor and Steve Ward's UD2. The trace above shows the bridge output. Look what happens when I adjust phase lead. The lead increases from left to right. Essentially, phase lead allows me to adjust how early I am. The left shows no phase lease - switching is spiky at the transitions, and the bridge rings. As phase lead is increased, the spikes are reduced. However, something interesting is happening here. Take a look at image 2 (closer up in image 3). 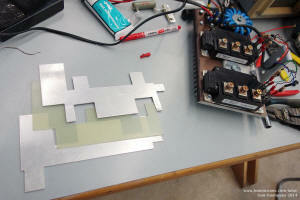 Here, we can see one diagonal leg of the IGBT bridge turning off. At this point, the primary current causes the voltage to change polarity as it charges up the junctions of the opposing freewheel diode. But it turns out that the other leg of the bridge is taking too long to turn on! The primary current changes direction (crosses 0) and so the voltage jumps back. After a while, the IGBTs finally turn on, causing the voltage to change rapidly. This is very visible in 3, where both the little spike is observed and the resulting ringyness of the bridge. 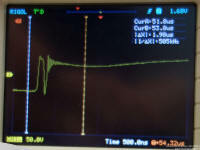 When phase lead is advanced even more (image 4), this effect disappears, but since switching is happening too early, significant current is switched and spikes are observed. The conclusion - my IGBTs are turning on too slowly. We can fix this by reducing the gate resistance. The above 4 images show what happens in an ideal situation. Here, I've fixed the gate resistance. The blue trace shows the gate voltage and the yellow, the bus voltage. 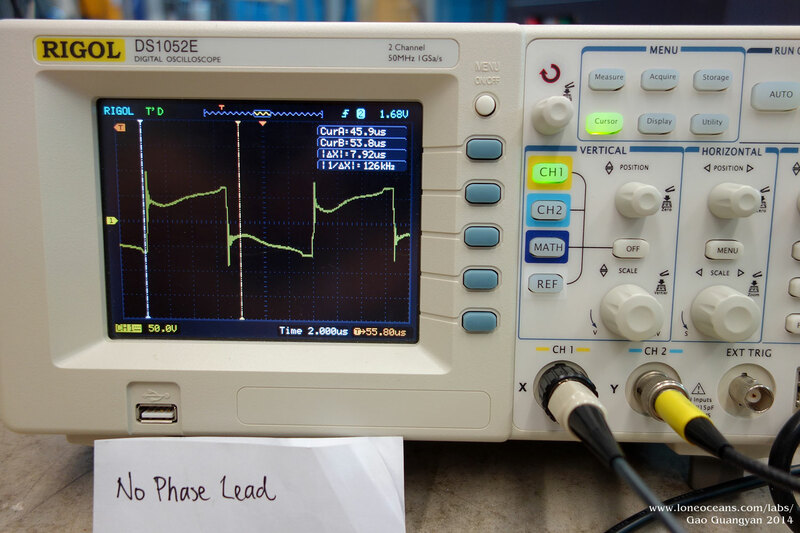 Image 1 shows no phase lead. We can see the ringing on the bus. As we advance the phase lead, we pass through 2, 3, and finally 4 (note the same result as previously!). Image 3 is the critical point I've set the coil. We can see a few things at once here. Note that the IGBT full turns on just when the gate is around 10V. This is very clear in image 3, where the gate voltage rises from 0 to about 10V, stays there for a while, before going up to 24V or so. 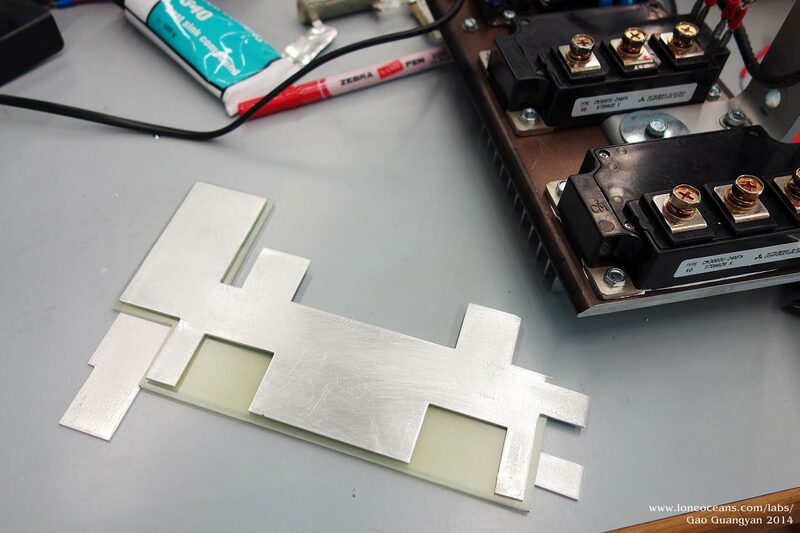 At the 10V plateau, this is where the IGBT really transits into a conductive state. 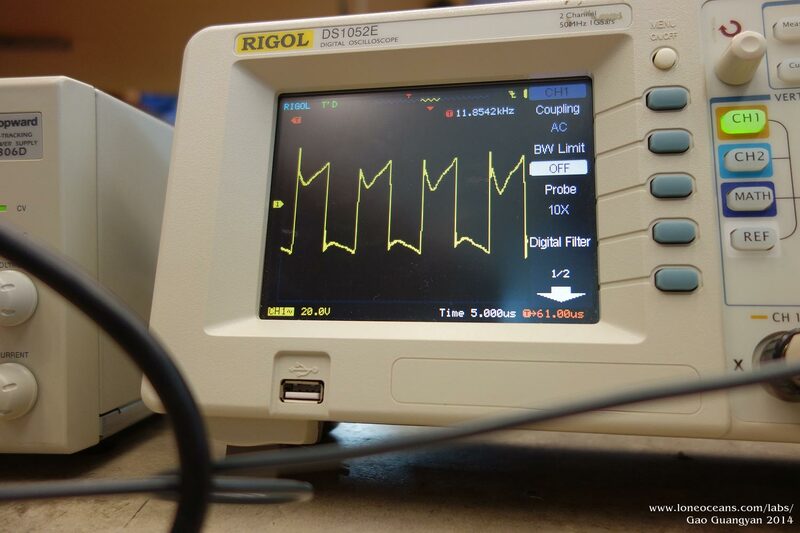 Note that in image 3, just when the bridge voltage falls to 0, we very quickly fall into the conductive region. We have achieved zero voltage switching! This is very desirable and is how most inductive switching is done. This also produces a very clean ring-free bridge output! Thus the coil was tuned this way. At this point, I'd like to say thanks for Steve Ward for a lot of this tuning advice and help in figuring all this out. The before and after shots are significant and the bridge no longer shows any appreciable spikes or ringing! Finally, note the 'tick' shape on the output of the bridge. The sag is simply caused by ohm's law while the primary current is flowing. It is slightly off-set due to the bus inductance. I've set the phase lead to work the best at about 20% Ipk, and for the later switches in the entire cycle. This seems to work well in practice. 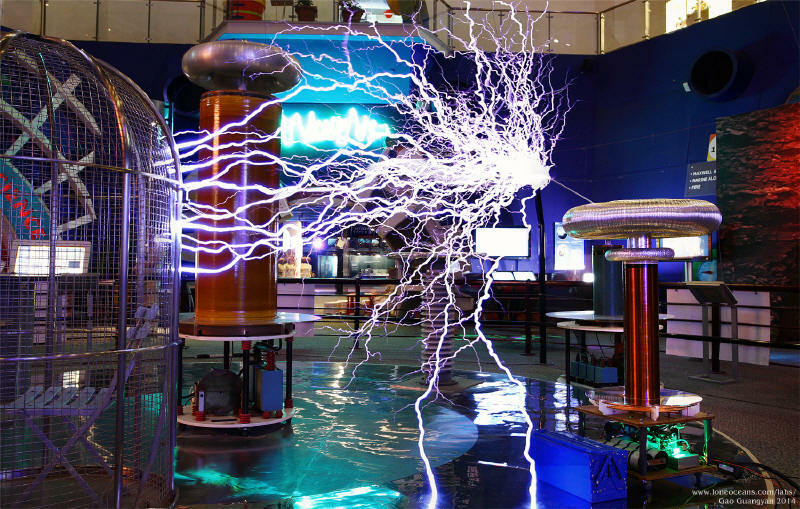 Below documents the Tesla Coil in action! Please contact me (see bottom of page) if you are interested in using any of the images. With the coil working as expected so far, it is time to put the coil to the test. 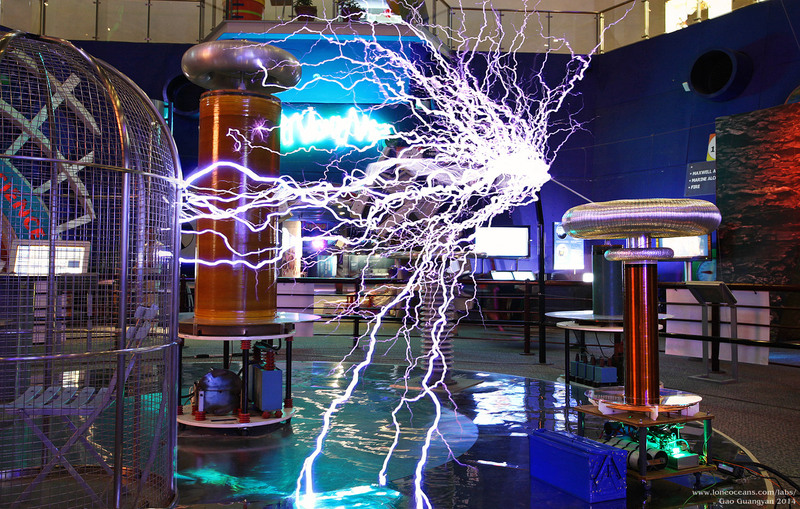 A large variac (looked at at least 4kVA) was used as the main power source, protected by a 40A breaker, as well as 15A fuses on the tesla coil side. 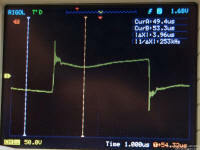 The test was carried out at small pulse widths (all below 110us pulse widths) with input voltages from 50V to 150V in 50VAC increments. 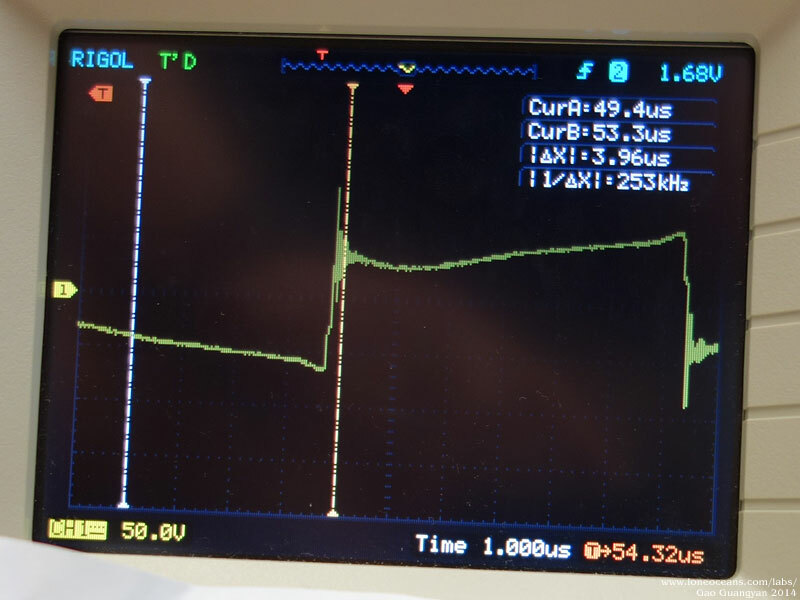 Low power testing at 150VAC input limited by OCD (~680A), tapped at turn 5.41. The right photo shows 425VDC on the bus at 110us, achieving about 6 feet arcs. Since the coil was at the Science Centre, safety is an important concern. 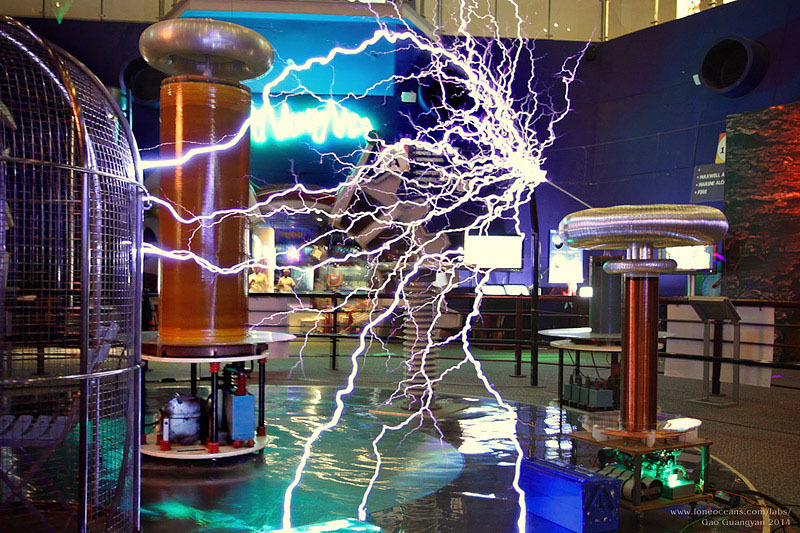 Fortunately, the SSC already has a shielded cage at the main atrium which houses the current conventional Tesla Coil. No more testing at home! With some help form the staff, I was able to bring the coil to the main atrium to conduct power testing in the cage. Needless to say, this was quite exciting no doubt due to the many curious visitors checking out the project :). Much to my relief, the coil performed spectacularly producing sparks and streamers 1.5m to ground easily, with merely 150VAC to the bus (420VDC out of 680VDC max). I will continue power testing to a maximum of 240VAC in to assess performance, before scaling the power back down for reliable operation. 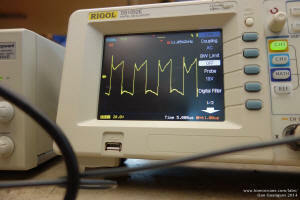 Two days later, I tested the coil at higher power, with the same 150VAC input (425VDC) at 100 -135us pulse widths. Maximum spark length today was just about 70 inches (1.78m) with occasional 680A OCD trips at about 110us mark and continual trips at 135us. The total power draw was just around 15A (2250VA) at low (sub 300) bps. However, playing music with high bps promptly blew my 15A fuses, so these will need to be upgraded to at least 30A fuses. I suspect that the total power draw required to achieve the same length sparks will actually decrease with increased tank voltage. So for more durable operation, several parts were upgraded mostly in terms of power connections. The IEC jack was replaced with a dedicated 50A terminal block for easy connection to the existing power cable, fuse now upgraded using a 30A 3AB fuse, and grounding wiring adjusted. 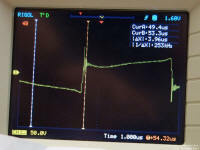 A ferrite bead was added to the GDT outputs to reduce common mode noise and the breakout point shortened to a more reasonable length. With the new parts, the coil was once again brought out for a power test, this time operating all the way up to 220VAC input. Maximum spark today was just in the neighborhood of 1.9m (just about 6.5 feet), achievable with the current OCD setting (~680A). Tuning of the primary coil was done with best results around 5+ to 5.5 with a dropoff at 6 or 4.5. A note about the following images - the Atrium turned out to be quite bright (e.g. aqua neon sign in the background, light from second level etc), even with the main lights switched off, and I was unable to get clear spark photos. Hence most of the photos below are video frame composites which were assembled using still images and high sensitivity video capture. They are however quite representative of how the coil looks like in real life - the sparks *are* very bright especially ground arcs. 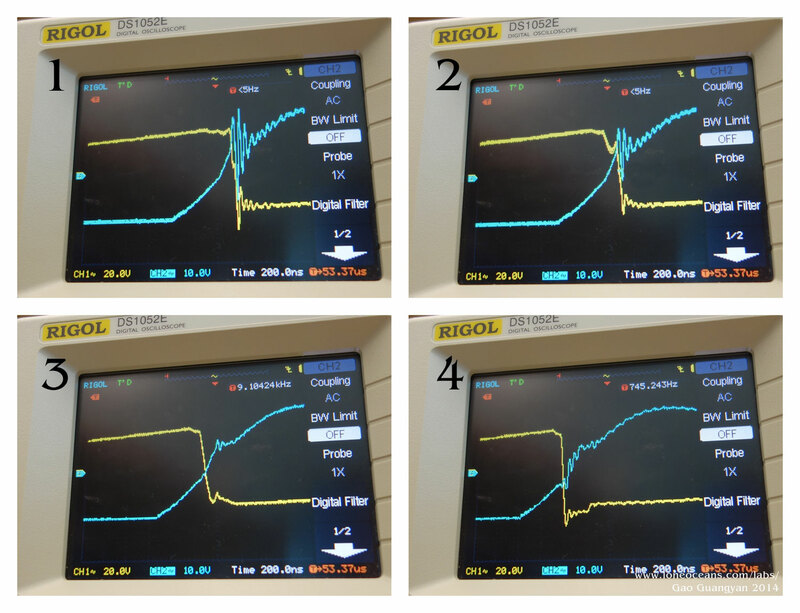 Composite stills from a video with the coil running at 185VAC on the bus at around 70us pulse widths (5 RF cycles). ~4.5kVA. 6'+ sparks. At bps of around 200 - 250, current draw was hovering at around 12A with 200VAC in at around 70us. Once the coil checked out good, I plugged it into polyphonic midi for a 1min continuous run playing Pirates of the Caribbean. This drew an average of 20+ to 25A, peaking at 30A+ with 185VAC in or so, also at around 70us. Overall performance was great though I have the nagging feeling that the tuning can be more finely adjusted and the OCD raised up to 800 or 850A. For more reliable running, the coil will probably be turned down to its current setting after a higher power test! After the full minute run, the temperature of the primary cables, heatsink/IGBTs and main power cables were only slightly warm, at most 10C above ambient, so it should hold up well! 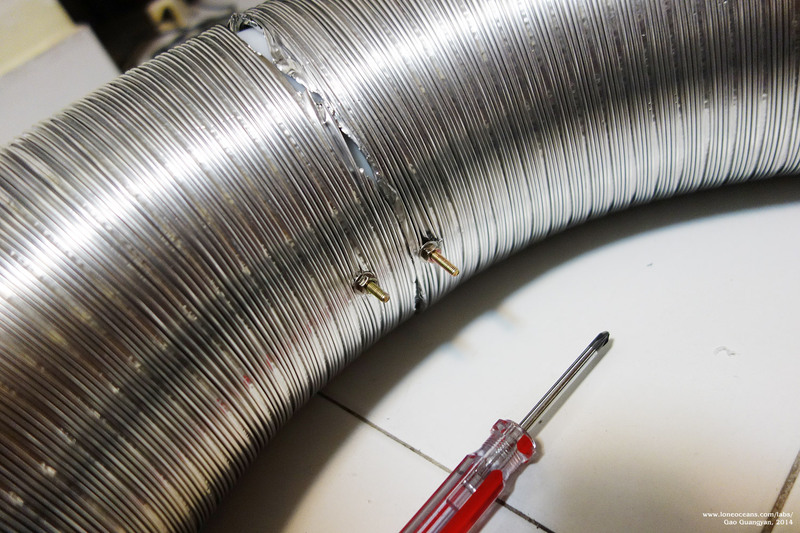 In order to determine how far I could push the coil, the OCD was increased from about 700A to 842A. This produced sparks exceeding 7 feet at turn 5.58! Test were run at 625V on the bus, with pulse widths at 70us and bps ~235Hz. Above shows the coil easily making ground strikes and was in danger of hitting the big coil (which it did several times!). The coil is working beautifully with sparks just about the same as the much bigger coil on the left! For reliability, the OCD was then reduced to 700A. At this point the coil is basically complete and I'm quite happy with how everyone turned out. As a prototype showpiece coil, the Science Centre and I decided that it would be a good idea to run the coil conservatively, so I the coil's OCD is now reduced to 700A running on a low ~180VAC input. This still easily produces 6 feet sparks, more than 2.5x the secondary length. I am now confident the coil will hold up at higher power input producing even greater 8 to 9 feet sparks in the future if we turn up the taps a little bit more! 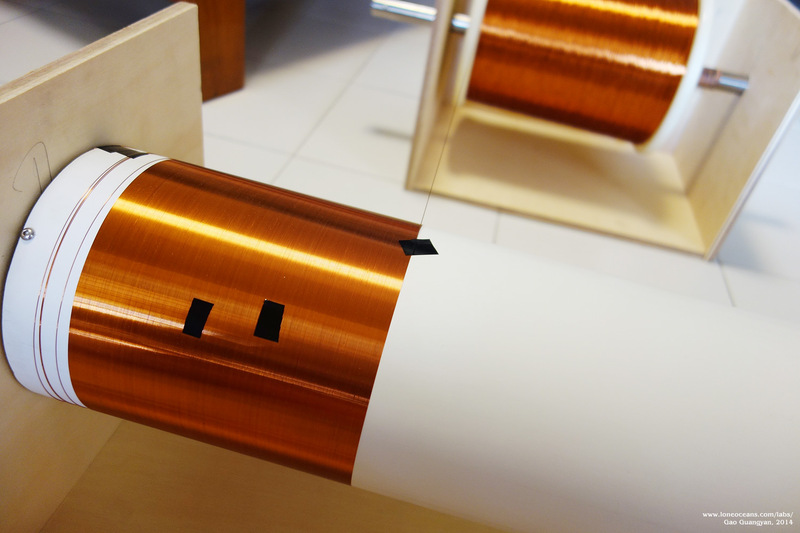 The prototype coil is now in public display at the Singapore Science Centre - a little bit more work needs to be done regarding installation, but it should be ready soon! Here are some videos of the coil in action during preliminary testing playing MIDI files. Pirates of the Caribbean - 185VAC, 20-25A, 700A, 70us. Dance of the Sugar Plum Fairy - 180VAC, 1.6 - 3.2kVA, 700A, 70us. Check out the coil in the Singapore Science Centre! I would like to thank the following people for help and inspiration for the coil! YX for helping me source and acquire suitable amounts of magnet wire - a challenging task in Singapore! 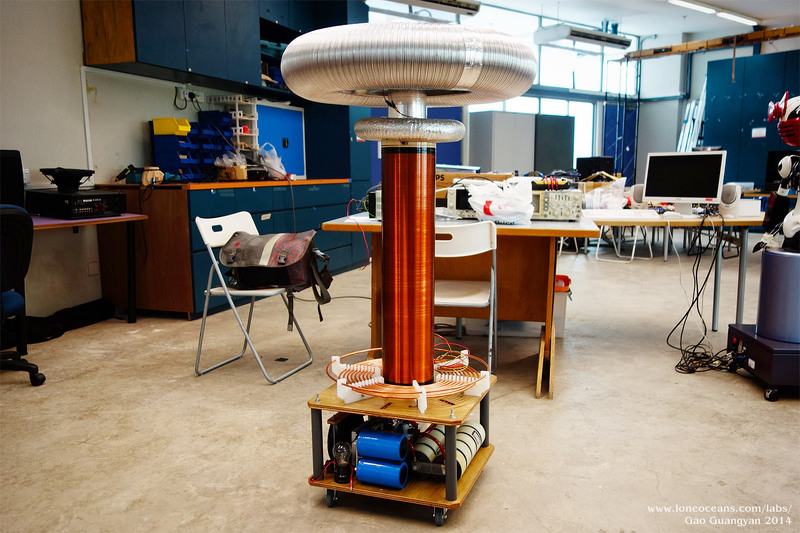 This coil remains as a fully functioning prototype musical tesla coil in the Singapore Science Centre today! Loneoceans Laboratories. Copyright (c) 2003 - 2014 Gao Guangyan, All Rights Reserved. Design 3.